Today Only: Earn 100% Bonus Aeroplan Miles on select Air Canada bookings within Canada or between Canada and the U.S. Checking my email just now and I see this offer that has a little over 3 hours left! If you register and book Economy Flex or higher fares by 7:59pm ET tonight you'll earn 100% bonus Aeroplan miles on those flights that are within Canada or between Canada and the U.S.
You must be an Aeroplan Member. If you are not an Aeroplan Member, you can visit the Aeroplan website (www.aeroplan.com) and enroll today. Membership is free. Must register on December 29, 2017. A one-time registration is required and can be completed online on this page. 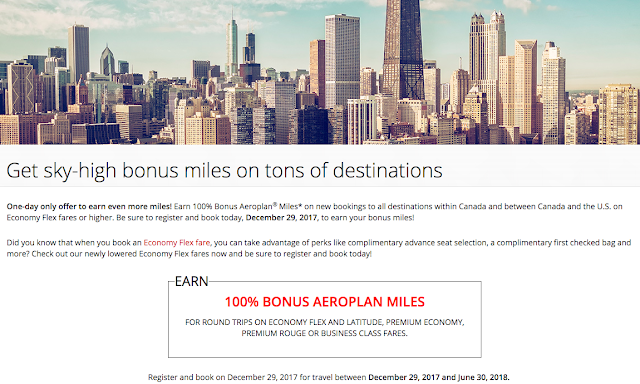 The Bonus Aeroplan Miles for eligible flights flown will be awarded for new bookings only made on December 29, 2017, by 19:59 Eastern Time inclusively, for travel on select eligible flights between December 29, 2017, and June 30, 2018. 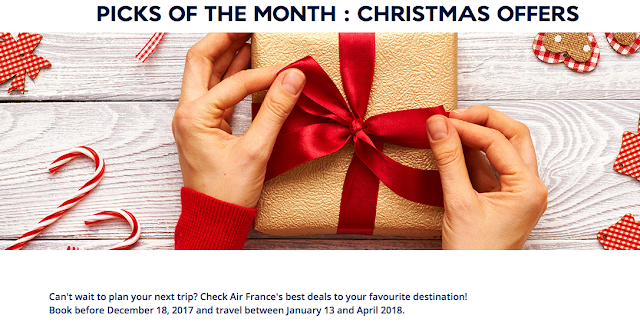 Only valid on select eligible scheduled non-stop or direct flights operated by Air Canada (including flights operated under the Air Canada Express® banner) and Air Canada Rouge®, for travel between December 29, 2017, and June 30, 2018. To qualify for the 100% Bonus Aeroplan Miles, the eligible round trips or two one-way flight segments must be travelled in the eligible fare options (booking classes) as follows: Economy Flex (although Tango and Flex fare options share certain booking classes, only Flex fare option purchases will be eligible for a bonus mile offer; Tango fare option purchases are excluded and are not eligible for a bonus mile offer); Economy Latitude; Premium Economy lowest; Premium Economy flexible; Premium Rouge; Business Class lowest; Business Class flexible. 100% Bonus Aeroplan Miles will be applied exclusively towards miles earned based on the distance flown as per the fare mileage accrual rule. 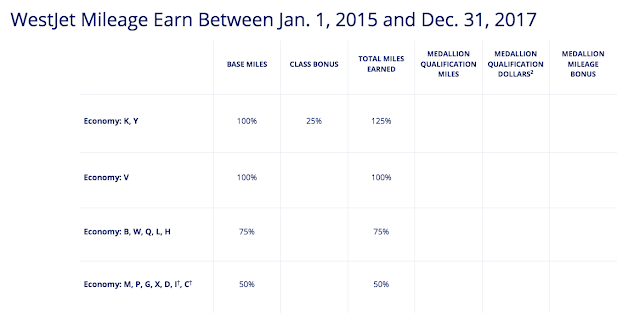 The class of service bonus miles and miles earned in conjunction with Altitude Bonus Select Privileges are excluded. 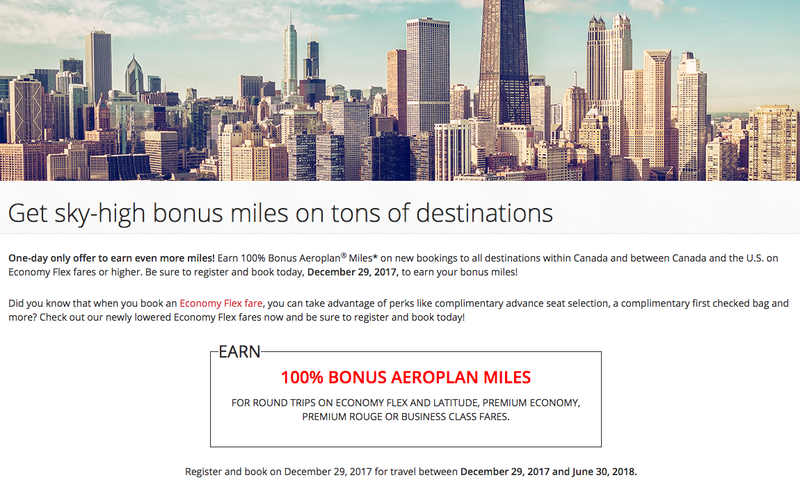 A minimum of one round trip or two one-way segments are required to earn any Bonus Aeroplan Miles. Valid on published fares and Flight Passes that are eligible for Aeroplan Mile accumulation. Offer is not valid when travelling on an Air Canada Unlimited Flight Pass. 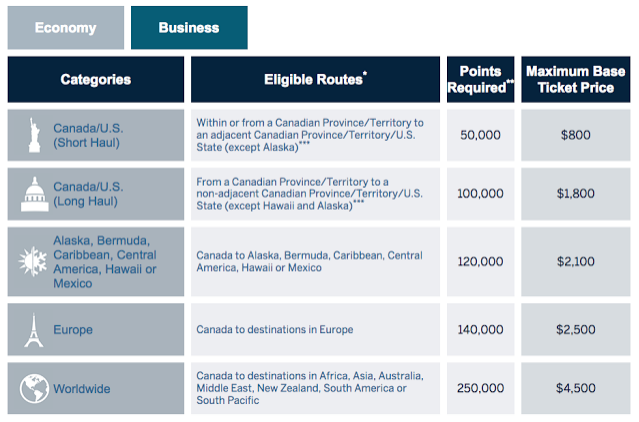 Bonus Aeroplan Miles are not Altitude Qualifying Miles and do not count towards Air Canada Altitude status. Upgraded flight segments (eUpgrades, Last-Minute Paid Upgrades, Star Alliance® Upgrade Awards, etc.) will be tracked for this promotion based on the eligibility of the original Economy Class fare purchased. A great way to boost your balances for stays at non-chain hotels or even at chains that aren't your regular cup of tea is booking via third party hotel sites like Kaligo. 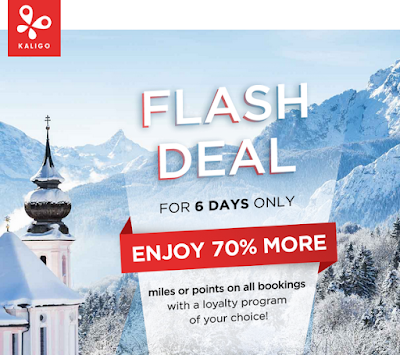 Right now you can get even more miles or points for Kaligo bookings with their Flash Sale that offers a 70% bonus! Episode 38 is the last Rewards Canada Round Up Podcast of 2017! You can listen to or download it on Apple iTunes, Google Play, our website and Soundcloud. This week the Rewards Canada Podcast takes a look back at the industry in 2017 and looks forward to what may happen in 2018. From credit cards to airline to hotel programs and more, we cover it in this episode. Earn 100 free Aeroplan miles for completing this survey. This is always a good way to keep your Aeroplan account current so you don't lose your miles to inactivity! Just a reminder to check out our American Express Cobalt Card Confirmed Multiplier Locations as the list is growing on a near daily basis. Click here to find which locations you'll earn 5 to 10x points at! 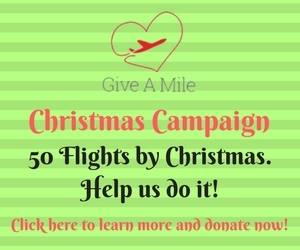 Be sure to check out the Give A Mile Flight Hero campaign! You can find out more and donate here. - 100 FREE Aeroplan Miles when you complete a brief survey. More... Until ? Aeroplan released details of some early Boxing Day offers to earn even more miles for your online shopping. 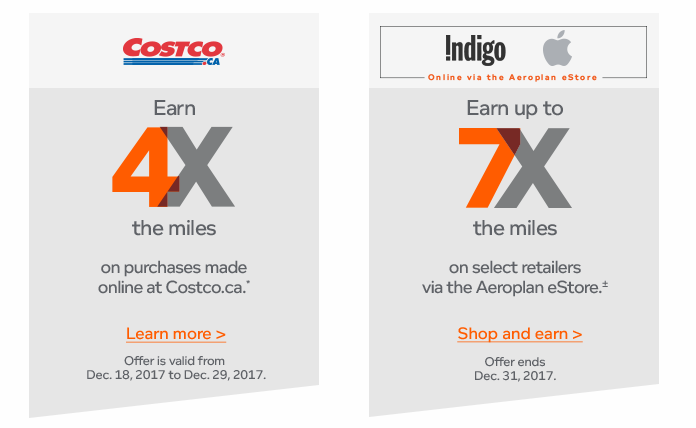 Right now purchases made on Costco.ca will earn 4x Aeroplan Miles or if you choose to shop online via the Aeroplan eStore you can earn up to 7x the miles depending on the retailer. While it may be too late to get something in for Christmas it is nice to get ready for the Boxing Day sales blitz! There are also offers in-store at Uniprix and Toyota - how about a new car under the tree? Find all the Boxing Day Aeroplan offers here. As we mentioned earlier today, we'd be bringing you the details of Marriott's latest systemwide promo that will run for the first part of 2018. We've seen IHG's, SPG's, Hilton's and now this is the Marriott offering. 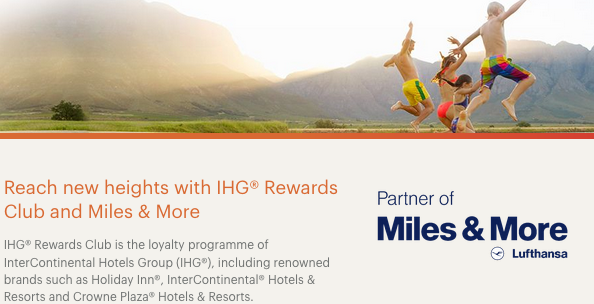 Members will earn 2,000 bonus Rewards points per stay starting with their second stay. If that 2nd stay or beyond includes a weekend night (Fri/Sat or Thu/Fri in the Middle East) Marriott will add an additional 1,000 bonus points in for a total of 3,000 bonus points per stay. The bonus maxes out at 50,000 points during the promotional period. As we always say, register for this offer now so that you don't forget about it in the future and end up having two Marriott stays and not getting any bonus points! We are quickly learning about all the major hotel promotions for the first part of 2018! We already know what IHG and SPG are offering. Later today we'll post Marriott's new offer but in this post we look Hilton's offer for the first third of 2018. Hilton was on a roll in 2017 by offering double points all year long with additional bonuses on top of the double points and all their promotions covered all hotels globally except for some in China. They continue this momentum into 2018 with this offer that awards up to 4,000 bonus points per stay at all hotels Worldwide except for Hampton by Hilton hotels in mainland China. The bonus awards 2,000 bonus points per stay, no matter what. 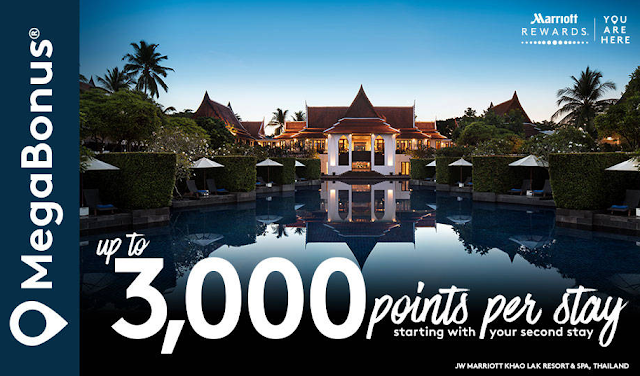 Complete 5 stays and Hilton will throw in an additional 10,000 points which works out to 4,000 points per stay. Rinse and repeat for stays after that. This is an awesome bonus for those who complete a lot of one night stays at locations that aren't expensive but shouldn't be overlooked for any Hilton stay as any bonuses are always good. Find many more Honors bonuses here! 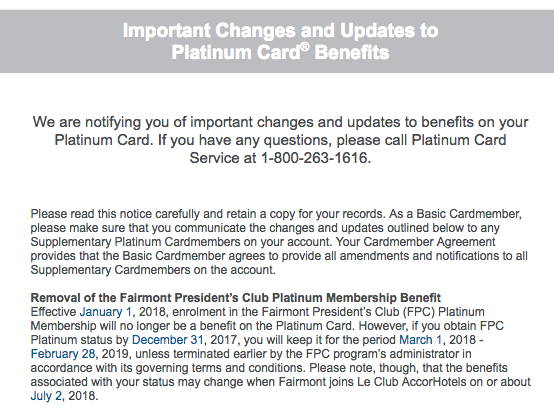 Last Friday American Express Canada sent out an email to holders of The Platinum Card that announced the discontinuation of the Fairmont President’s Club Platinum Membership Benefit. This was pretty much expected since we saw the letter for the Visa Infinite Privilege cards a few weeks ago, a comment from one our readers that Amex customer service told them as such and then the email from Accor and Fairmont announcing the integration of President's Club into Le Club AccorHotels. The Platinum Card already lost the Platinum Status benefit with Le Club AccorHotels some time ago and now of course this benefit is leaving the program. Of course this one is beyond Amex's control but it was one of the most sought after benefits of the card. Hopefully Amex is working on adding some new hotel benefits to the card, not that the remaining ones should be ignored, Gold Elite Status with Starwood Preferred Guest (which gets you Gold Elite Status with Marriott), Gold Elite Status in Club Carlson and Gold Elite Status in Hilton Honors. All great benefits considering other hotel programs like Best Western Rewards will match any of those statuses! Starwood has released the details of the next systemwide promotion for SPG members. Registration is now open for the offer titled Great Weeks, Grand Weekends which will award Double Starpoints starting with your second stay. You'll also receive 500 bonus Starpoints if that 2nd stay or beyond includes a weekend night (Friday or Saturday, Thursday or Friday in the Middle East). This offer is somewhat weaker than what SPG has been running lately seeing that it starts with the second stay, although that requirement is typical of SPG's first quarter promotions and once again they have introduced a participating hotel list which means there are hotels that will not be offering the bonus points. 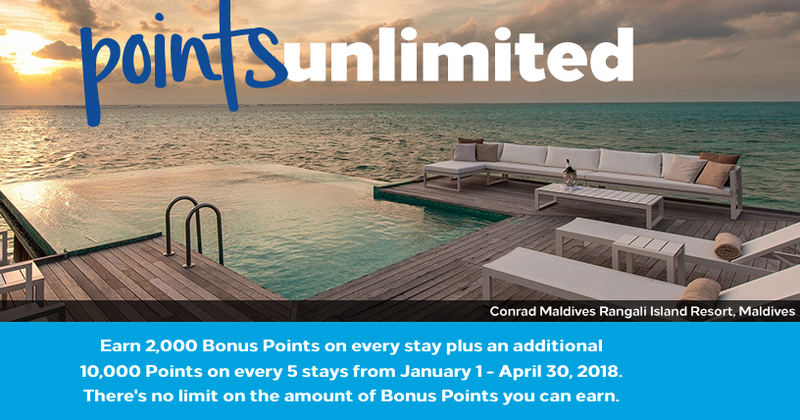 Nonetheless you should register for this promotion right away even if you don't have any stays planned to ensure you earn any possible bonus points on future stays. 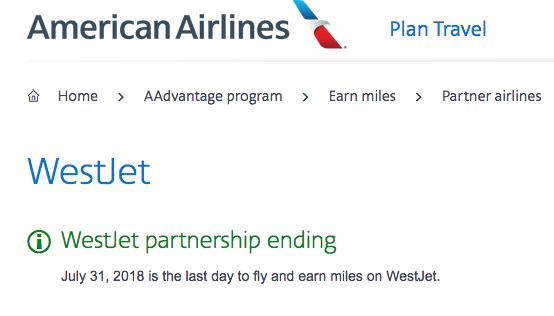 WestJet Rewards will be losing their first ever airline partner next year. American Airlines and WestJet will part ways at the end of July 2018. 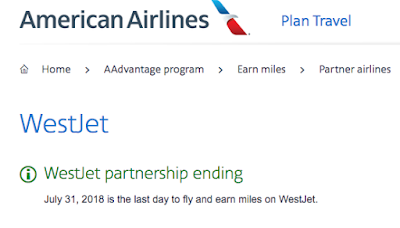 The partnership has been around since June of 2012 but with the announcement last week that WestJet and Delta are looking at forming a Joint Venture it is no wonder the partnership with AA will come to an end. CORRECTION - Thanks to Nunavut Wolf for pointing out that earning is going up not down! Aeroplan earn rates for flying on First Air changed at the beginning of December just like they did for Canadian North. Once again the amount of miles earned is going down in most fare classes. Is Aeroplan prepping their non Star Alliance airlines that will likely remain partners with them post 2020 to help their revenues? - Continue to earn 100% of the miles in booking class Y. - Earn 100% of the miles in booking class C, M . For travel until November 30, 2017, earn 75%. - Continue to earn 75% of the miles in booking class B. - Earn 75% in booking class H. For travel until November 30, 2017 earn 50%. - Earn 75% in booking class N. For travel until November 30, 2017 earn 25%. - Earn 50% of the miles in booking class G. For travel until November 30, 2017 earn 25%. - Continue to earn 25% of the miles you fly in booking class Q. - Earn 25% in new booking class A. We don't mention new routes that start outside of Canada very often unless they will have some bearing for us in terms of rewards and one route announced this week that should be of interest to a lot of Star Alliance collectors is United Airlines' new San Francisco to Tahiti route. This route will launch in October of 2018 and be winter seasonal to start but it now allows for the possibilty of using Aeroplan, MileagePlus and other Star Alliance miles to get to Tahiti! The route is only 3x weekly so there will be lots of competition for those award seats but if you do snag them, especially in business class, you'll enjoy the comfort on United's 787-8 aircraft! I had the occasion to spend a couple of days at the Manitou Springs Resort & Mineral Spa. This is an older hotel, but is kept in good condition. In fact, it was under renovation during my stay. The renovation work in no way interfered with my stay as it was being carried out during the day. Even though the lobby floor was part of the renovations, there was no disruption to either the check-in or check-out process. The room was quite comfortable, with the usual amenities (coffee machine, fridge, hair dryer, ironing board, and the usual toiletries. There was also a bottle of red and a bottle of white wine available in the room (though these were not complimentary), but the convenience factor was nice if you cared to indulge. There was also a safe available for use, but as it was not bolted down to anything (just sitting on the table), I don’t think it was of much use. Granted, it would be difficult for anyone to get at the contents once locked, but it could be easily carried out of the room to open at leisure offsite. The bed was very comfortable, sleep was not an issue. Water pressure and temperature in the shower was fine, no issues with either. The hotel was very quiet, though this is the off season, so the occupancy rate was not high. The only downside to the stay was the wireless Internet; it was very poor which was a surprise as there were very few guests in the hotel (I was 1 of only 5). However, this was mentioned to the Front Desk and I am certain they will look into improving it. They had an on-site Waters Edge restaurant & lounge which I utilized both nights. It has been a long time since I have seen a salad bar, but it was nice to be able to choose your own salad fixings. The food was very good; I had the ribs (choice of 4 flavors) one night and the lasagna the other. Portion size was very good, no question about value for your money. Service was great, attentive staff. The lounge had 3 VLT’s if you felt like taking a chance with Lady Luck….. The hotel itself is located right across the street from Lake Manitou, known as the Dead Sea of Canada due to its high salt content. It was, of course, partially frozen at this time of year. The big claim to fame for this Hotel is the spa and mineral waters that they are able to utilize from the lake. There is a very large pool area, but as it was part of the renovations, I am unable to offer an opinion on it. Overall, I would recommend staying at this Hotel when you are in the Watrous Area. With all the health benefits available from the mineral waters, it is a good place to rest (and relieve) your aches and pains. For more details on this hotel visit: Manitou Springs Resort & Mineral Spa. This post is the third and final part of a closer look at American Express' Membership Rewards program. Since 2014 Rewards Canada has rated it as the number one loyalty currency for Canadians, and while the program has evolved over time, innovative new features keep the program at the top of our list. One of the most recent additions is the Fixed Points Travel Program. The Fixed Points Travel Program is a take on traditional reward flights from frequent flyer programs. That is, you use a set amount of points to travel within, or to, certain regions without typically worrying about the price. Booking flights using fixed points can come handy, especially during peak seasons when market fares are quite high. Amex’s Fixed Points Travel Program doesn’t limit specific airlines you need to book with. You can literally fly any airline, any time to any destination! This provides a lot more flexibility than your traditional reward program, where typically the biggest complaint is a lack of flight availability! The portfolio of Membership Rewards’ earning cards provides various earning options, from 1 point per dollar spent to up to 5 points per dollar, which means you can fly for as little as $3,000 in spending depending on what card you have. You won’t get that with any other card in Canada! Even business class to Europe is an amazing deal, only $28,000 in spending at 5x points (the American Express Cobalt card is your 5x card!) gets you that round trip flight to Europe. It would cost almost double for most other cards in Canada! Let's now look at how you can pull some real value out of the Fixed Points Travel Program. We searched a flight from Toronto to Los Angeles from March 15 to 18, 2018. For those dates, you can fly direct on Air Canada (ticketed by United) for $699.97. This price was confirmed on the American Express Travel website and on United's site as well. When you search on American Express Travel and select the flights you’d like, you'll have the option to choose between the Fixed Points Travel program or the Flexible Points Travel Program. When you select either option, it will adjust the screen to tell you how many points you need. If you wanted to pay for this flight using only points you can see that the Fixed Points Program is your better option, as it would run you 54,799 points versus 69,997 with the Flexible Points option. The maximum ticket price allowed for a long haul North America flight is $700 which is covered by the 40,000 points. The remaining $259.97 plus taxes and fees of $168.39 can be paid with cash or using the slider once again to use points against those additional amounts. Overall, the Fixed Points Travel Program is a great option for travel bookings when you have flights that approach that maximum ticket amount allotted to each category. If there is a seat sale, you may be better off with the Flexible Points option. That's where even the American Express Travel booking engine comes out ahead. You don't have to do multiple searches to decide whether Fixed or Flexible would be the better option. Just toggle between the 2 buttons once you search your itinerary and see which one gives you better value! Simple as that! Finally, you should note as well that these are actual revenue tickets for flights on these airlines. They are not your typical award tickets seen from your traditional frequent flyer programs. What does that mean? It means, in most cases, you'll earn frequent flyer miles for these flights with the respective program of your choice. 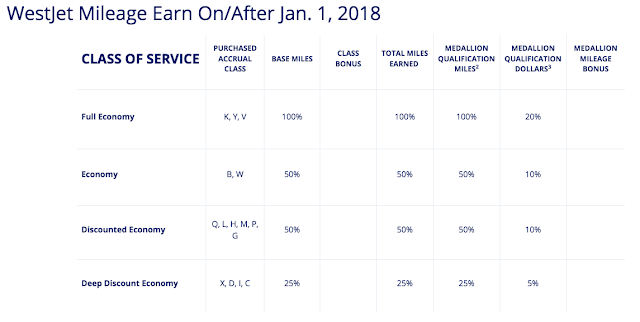 For the examples above, you could credit these flights and still earn miles from Aeroplan, United MileagePlus, or virtually any other Star Alliance program. By having this very versatile option, American Express is giving their Cardmembers every possible route to getting the most out of their points. Whether it's the Fixed Points option, Flexible Points option, or even transferring points to a partner program, all of which could be used for the flight examples above, you get to make the choice that represents the best value for you. Most other proprietary credit card programs or even traditional frequent flyer programs do not give this many options for booking travel. Learn more about American Express Membership Rewards Fixed Points Travel program here. How about you? Have you used the Fixed Points Travel program? Tell us how and what for and feel free to ask us your questions about the program if you aren't a Cardmember yet. This is part three of a three-part Membership Rewards series sponsored by American Express. Delta SkyMiles is lowering the amount of SkyMiles earned on many of their partner airlines in select fare classes. 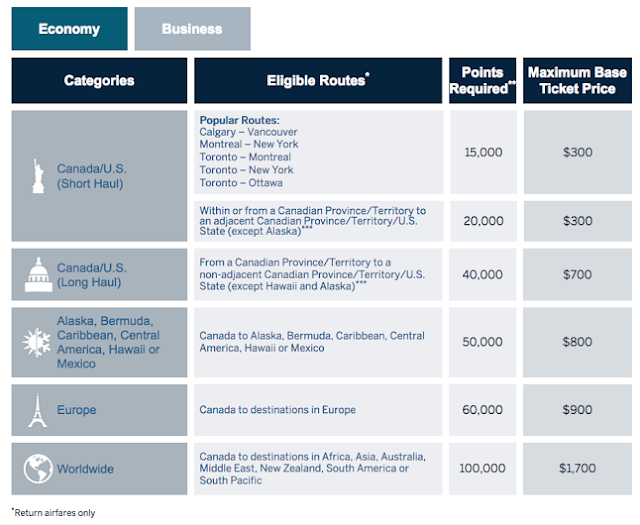 For example, here is a comparison of what you earn flying on WestJet now and after the changes take effect on January 1. The good news is that WestJet flights will now count towards Medallion qualifying status. You can find all the changes listed here.